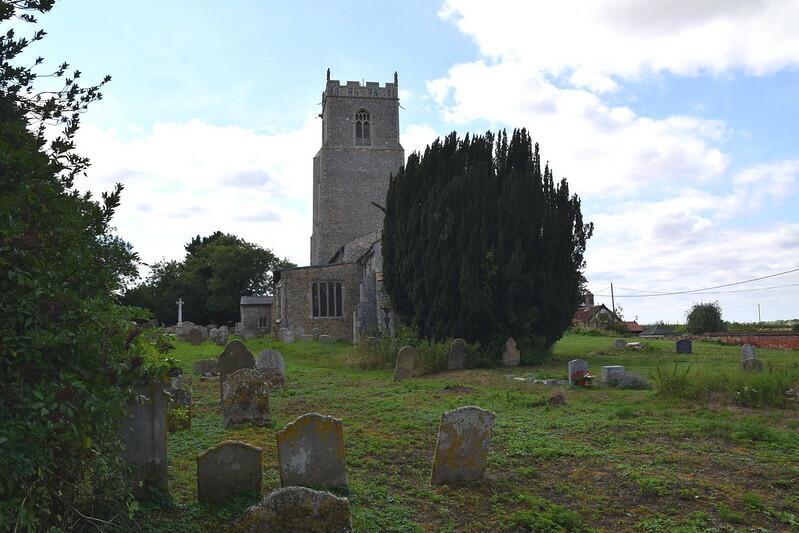 Norfolk is so rural that between Diss and Wymondham the villages just disappear into the woods and rolling fields, but if you ever wanted to find Tibenham in a hurry, you'd need do no more than look for the tower of All Saints. In a part of the county where churches tend to be small and round-towered, this one is huge, a vast 15th century sentinel that dwarfs the little village around it. 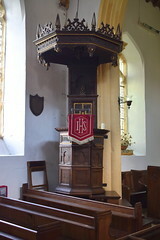 The tower is at the highest point in the parish, and is a beacon to this part of south Norfolk. That said, the tower itself is not particularly attractive, because the eastern face is sheer, dwarfing the building beneath. Perhaps a rebuilding of the nave was planned, or more likely the tower was simply intended to impress. 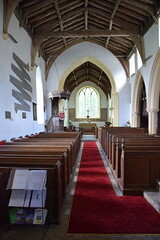 The body of the nave and chancel are only slightly before the tower, although there's some evidence of the earlier church that they replaced. The starkness of the north side, which has no aisle, matches the tower. 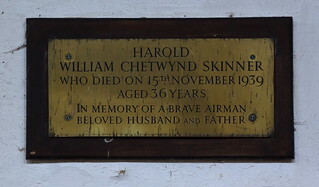 The austerity of the whole piece is accentuated by the narrow sleeve of the churchyard, making this a difficult church to photograph. The great yew tree immediately to the east of the church doesn't help, of course. But stepping inside, the interior is light and crisp, a thorough 19th century restoration giving it a wide, open feel, much larger than the nave appears from outside. 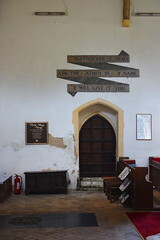 Neither Mortlock or Pevsner thought much of the scriptural quotations in banners around the wall, but in truth they give the church a bit of the character it cries out for. It is easy to be critical of the Victorians, and we need to remember that many large churches were in a parlous state by the early 19th century, but in truth it is so rare to find a church this big that still has the rustic feel that they worked so hard to eradicate. 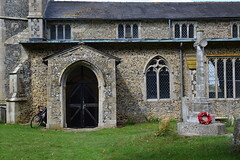 But Tibenham church feels loved and well-used, which is what really counts if it is to continue as a living, working church. And it is not without interest, for it includes something very unusual indeed. 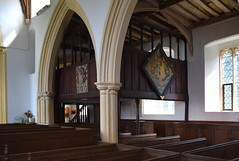 This is the Buxton pew, an early 17th century enclosure raised some two metres above the east end of the south aisle. 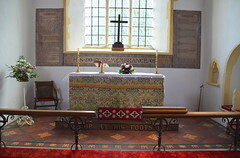 There are several raised pews in Norfolk, the Astley pew at in the south transept at Melton Constable for example, and the Chadd pew in the south aisle at Thursford both spring to mind. But those are both raised over the family crypt. This is the only one you can actually walk beneath. 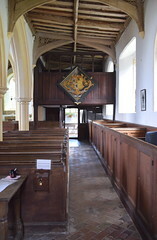 You get to it by a staircase which turns up from the east end of the aisle, and when you get inside you are likely to see as much woodwork as anything going on below. 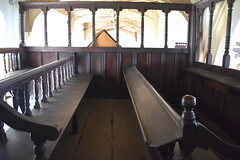 It probably wasn't intended as a family pew at all, but as a place for the Buxton servants to sit. The Buxton arms are on the north side, and a Buxton hatchment hangs on the west. 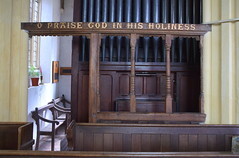 The Buxton pew is by no means the grandest piece of woodwork in All Saints. This accolade must go to the pulpit. It towers a good four metres above the north-east corner of the nave, its tympanum like a a huge, elegant crown. I don't usually mention moveable furnishings on this site, but this is so vast that it could never be removed. It must have been put together in situ. 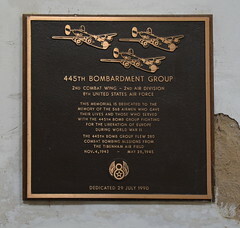 A recent plaque remembers the 445th Bombardment Group of US Air Force which flew from Tibenham airfield, today mainly used by gliders. 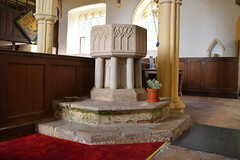 The traceried font sits nearby on its colonnade at the west end of the nave and looks very fine, particularly in this open space. 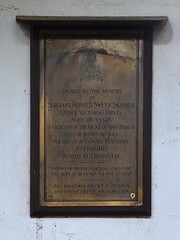 And just beyond the Buxton pew hide the royal arms to George I. 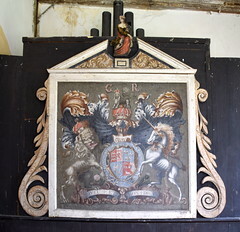 Still in their original frame with its curling supports, they have been bleached to a silvery grey by the passing of the years.